Sun, Sep 9, 2018, 04:29 pm SL Time, ColomboPage News Desk, Sri Lanka. 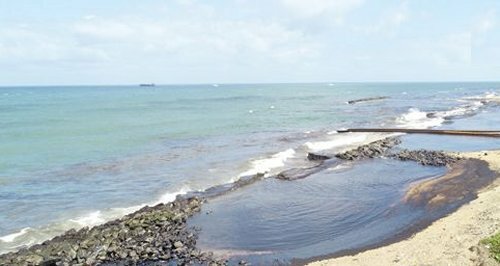 Sept 09, Colombo: Sri Lanka Navy has sprung into action to minimize the environmental damage caused in Dikowita area due to an oil spill from a pipeline carrying oil to the Muthurajawela Oil Refinery Complex from the shore, yesterday (08th September). 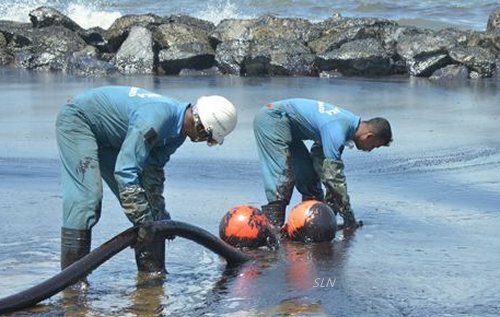 The oil removing efforts are being currently carried out by Ceylon Petroleum Corporation (CPC) and Sri Lanka Coast Guard (SLCG) in coordination with the Navy. Accordingly, a group of naval personnel attached to the Western Naval Command was rushed to the location following the directives of the Naval Headquarters, on receipt of the distress call. Further, cleaning up work has been expedited with Sri Lanka Coast Guard ships 'Samaraksha' and 'Samudra Raksha' - two vessels presented to the SLCG by the Japanese Government on 29th August. Meanwhile, officers and sailors of the Navy and Coast Guard commenced cleaning up of oil spread in the beach area from Dikowita to Uswetakeiyyawa this morning with the assistance of the experts of the Marine Environment Protection Authority. This mammoth effort is by far augmented by 300 personnel belonging to both Sri Lanka Navy and Coast Guard. Realizing the importance of responding promptly to possible oil spills at sea, with maximum efficiency, Sri Lanka Navy in coordination with the SLCG performs drills of this nature on a regular basis to ensure that minimum damage is caused to the environment during such disasters (Navy Media Unit).